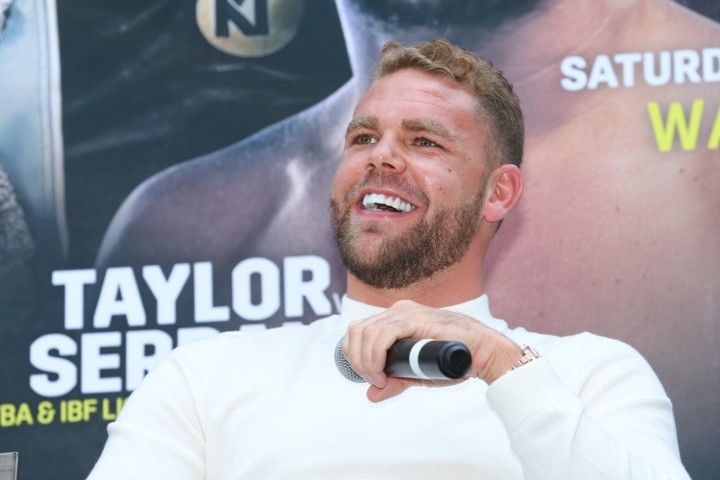 It was announced on Monday that Billy Joe Saunders will fight Shefat Isufi for the WBO Interim super middleweight world title on Saturday May 18 at The Lamex Stadium, home of Stevenage Football Club, live on BT Sport. He was set to make a further defence last October against mandatory challenger Demetrius Andrade, but eventually opted to relinquish his title after the Massachusetts commission refused to licence him to fight in Boston after an adverse finding in a VADA test. According to Saunders' promoter, Frank Warren, he tired to make a rematch with Chris Eubank Jr., who holds the IBO's version of the 168-pound title. Saunders won a close twelve round decision over Eubank Jr. when they were unbeaten prospects at middleweight several years ago. "We tried to make the Chris Eubank Jr rematch and they didn’t want to know, they don’t want Eubank to fight Billy Joe Saunders under any circumstances," Warren said. "The champion Gilberto Ramirez called the WBO and said he would vacate and they put the fight out to Billy and Isufu and we agreed terms, but Ramirez then said he hadn’t decided so this is now interim title. I believe Ramirez could vacate and the winner will be declared full champion. Tags: Billy Joe Saunders Chris Eubank Jr.
Sniffy Joe Saunders is a clown?